The popularity of breastfeeding in the United States is on the rise. According to the Centers for Disease Control and Prevention 2012 statistics 76.9 percent of mothers breastfeed. Women are also breastfeeding longer—a reported 47.2 percent continued for up to 6 months. With stats like that it’s no wonder manufacturers and retailers are seeing a greater demand for well-fitting and stylish nursing bras. So how can your retail business keep up? 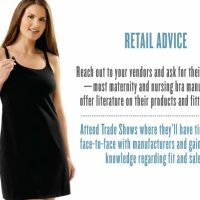 Here, The Lingerie Journal spoke to six cutting-edge maternity and nursing bra manufacturers to get their advice on building a well-rounded stock. In addition to full coverage bras, nursing tanks are versatile and can be worn throughout the entire pregnancy. Melinda G has had success with its Cami Sutra Nursing Cami. The fitted tank is long enough to cover the tops of unbuttoned jeans, and stretches to fit over a pregnant belly. The top features drop cups with easy to secure clips. “It’s designed for nursing but it doesn’t scream nursing top. It works well through the entire pregnancy,” says Gros. Above and from left: Glamourmom Nursing Bra Full Bust Long Top in Grape and Glamourmom Nursing Bra Full Bust Slimming Long Top-Black. Other manufacturers agree. “Nursing tanks are great for layering and do not ride up,” says owner and designer of Glamourmom, Line Rothman. The brand recently introduced a new Full Bust Slimming Long Top that features a full structured built-in adjustable nursing bra and an outer layer of fabric that shapes and smoothes the bust, waistline and back. Additionally, Cake Lingerie has launched a new range of seamless nursing tanks. Remind your expectant customers to begin shopping for the nursing bras she plans to wear post-partum during the eighth and ninth month. Fitting a women at the end of her pregnancy will ensure the bra will fit once her milk comes in, says Haidee Johnstone, senior vice president and director of design for Leading Lady. But one is not enough: “She’ll need to buy at least three bras—the one she’s wearing, one in the drawer and one in the wash,” Johnstone adds. 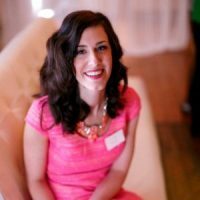 “A nursing woman’s size may change depending on the time of day,” adds Alyssa Weiss, co-founder of Belabumbum. She recommends stocking soft, non-constructed sleep bras for new moms. Belabumbum’s nursing bras feature adjustable shoulder straps, six adjustment hooks to accommodate women’s changing body before and after birth and cups made from breathable microfibers and cottons. More styles that easily adapt to a woman’s changing body come from QT Intimates, which makes nursing bras under the QT label and holds the license for La Leche League Intimates. It’s new adjustable band bra is perfect for accommodating a women’s changing body after she has a baby says Meryl Kutzin, vice president of production and merchandising. Leading Lady has also introduced the Crossover Front Closure Racer Back Leisure bra that has a hook and eye front closure with adjustment options making it easy to open during the night. Additionally, all of Leading Lady’s nursing bras feature four adjustment hooks and underwires have a wider “u” shape that won’t pinch. Generally, underwire bras are not recommended during the first few weeks as they may interfere with milk production and can cause mastitis, an infection of the breast tissue. 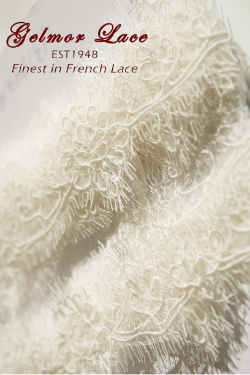 However, Johnstone created the oversized underwire when she found that women who feel more supported in this style were requesting it. 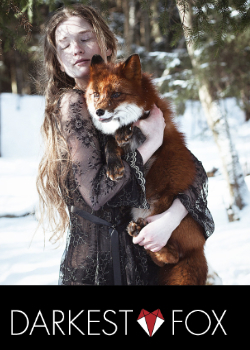 Color is one way designers are infusing style and current trends into their collections. This season QT Intimates’ nursing bras will make a statement with bold colors, like black lace trimmed in hot pink and peacock blue and a new leopard print. Leading Lady has added lavender to its lace wire-free and underwire bras. And Belabumbum is offering brilliant jewel tones like eggplant and turquois. 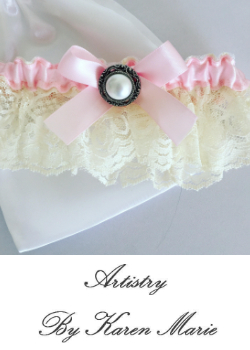 Stocking nursing bras will be no good to your business if you and your staff are not confident fitting and marketing them to pregnant women. 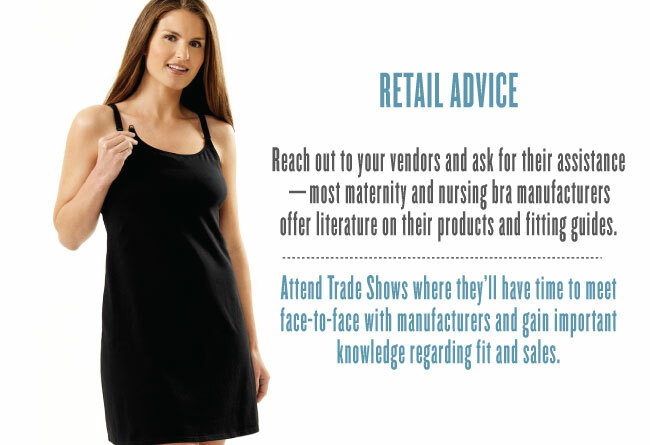 Reach out to your vendors and ask for their assistance—most maternity and nursing bra manufacturers offer literature on their products and fitting guides. Leading Lady shares their fit measurements with retailers to let them know how they size bras. And for non-specific sizes, like S, M, L, XL, they offer conversion charts that retailers can cross-reference. If that’s not enough, most manufacturers will be available to speak directly to you and answer any questions you may have regarding fit. “We are always available to speak to stores one-on-one,” says Weiss. And Leading Lady’s Johnstone is also available to discuss fit with retailers. Gros recommends retailers attend trade shows where they’ll have time to meet face-to-face with manufacturers and gain important knowledge regarding fit and sales. She’s also been known to visit stores for mini fit clinics with their staff. “We walk them through the fitting process when the customer is right there, showing them what to check and what to look for,” she says. 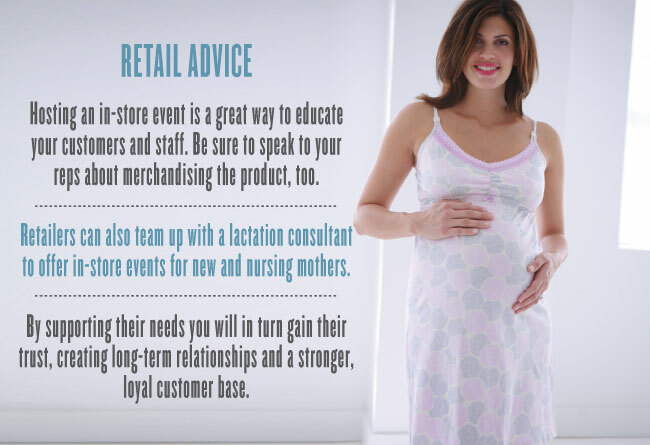 Retailers can also team up with a lactation consultant to offer in-store events for new and nursing mothers. During this time mothers are looking for support and an opportunity to meet with other women who breastfeed. Have a lactation consultant on hand to lead a group discussion and answer questions. And be sure to invite moms to bring along their babies—if you present your store as a comfortable environment where breastfeeding is encourages they will be more likely to return to you for their intimate apparel needs. To find a lactation consultant near you, contact your local La Leche League chapter at http://www.llli.org/. 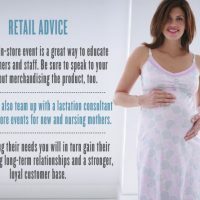 Adding nursing apparel to your store can help you connect with a growing number of women who are pregnant and breastfeed. By supporting their needs you will in turn gain their trust, creating long-term relationships and a stronger, loyal customer base. This is really informative. I am going to print it off and add it to my knowlege pile. As a lingerie consultant I fit expectant and nursing mums so this is really good to know. Congratulations for this informative article, it was a joy to read! Maternity intimate wear has been popular ever since in Brazil, together with plus size lingerie it is one of the segments which continues to experience above average growth rates.